The names Cormack and Sharp, appearing on billboards outside variety theatres and in hotel cabaret, guaranteed a popular, high-quality musical twosome in Scotland, England, and Ireland, for close on three decades. That was the rule from the 1950s through to the 70s, when live variety and popular Scottish revue flourished from Aberdeen and Inverness all the way down to most of Scotland's central belt. George Burnett Cormack and Irene Stewart Sharp were an intrinsic part of that popular entertainment heritage. George and his lovely brunette partner and wife Irene, a Glasgow lass who could easily have doubled for the film actress Elizabeth Taylor, became favourites with a wide audience of theatregoers all the way from George's native Aberdeen to summer shows in Eastbourne and Llandudno, and then across the Atlantic to American cities like Detroit, New York, and San Francisco. Audiences applauded them on their busy and widespread theatrical touring. But only a few of their admirers knew George's wartime secret - how, after apprenticeship as a stonemason in Aberdeen, he had joined the Territorial Army and flown on active service with the medical corps, parachuting against all the risks and dangers into Arnhem where he stayed behind to tend the wounded. 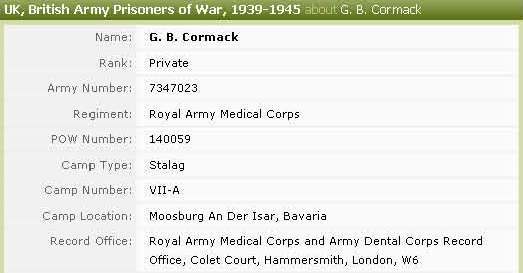 This meant capture and retention in a prison camp; it was here that he used his singing talents to advantage in musical and band shows, raising the spirits of fellow PoWs with many a stirring Scottish tune. His picture in wartime uniform is held today in the Airborne Museum, commemorating those deeds of valour that make Arnhem a place-name linked for all time with bravery in air-landing combat. The Hitler war over, George went professional as a singer, winning spots in the many variety theatres then flourishing in Scotland. 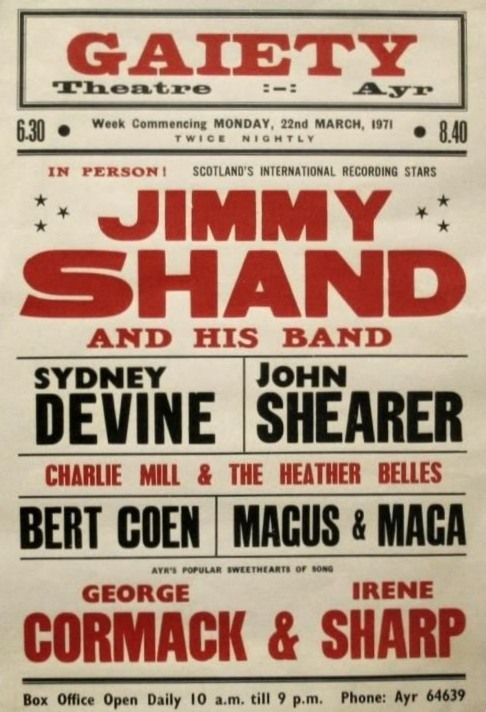 He joined the Lex McLean show at the little Palladium Theatre in Edinburgh's Fountainbridge, a nursery for so many showbiz aspirants, and found himself on the same bill as bright-eyed Irene Sharp from Glasgow's Lambhill. They compared singing notes, fell in love, then decided to form a double act and get married. They 'tied the knot' in Dunblane and Lecropt in 1952 to become one of the happiest of twosomes both offstage and on. and persuaded his good friend and fellow-traveller Katharine Hepburn to learn the correct lyrics of Loch Lomond. Rex Harrison, bound to and from Broadway, was another theatrical admirer, one of a procession of thespian voyagers relaxing as audience members in a refreshing style of mid-Atlantic cabaret featuring songs from Scotland, all the more appropriate since it was being staged on a Clyde-built ship. The Queen Mary and Queen Elizabeth liners became almost a second home to the Scots twosome. Later, they sailed on cruise ships around South America and to South Africa, George introducing the act in that wholesome and friendly Aberdeen accent he never lost. Illness dogged Cormack in his latter years, but he was able to appreciate and enjoy family toasts to his 78th birthday before going into hospital where he died from a severe heart attack five days later. He was survived by his wife Irene, daughter Lee-Anne, son-in-law Duncan, and a two-and-a-half-year-old grandson Adam, as well as by his four sisters in Aberdeen. 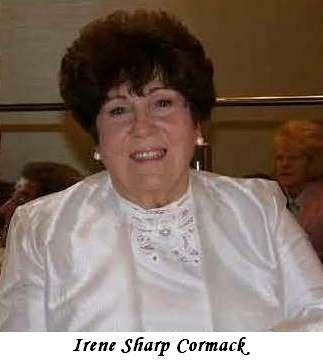 On Sunday the 12th of April, 2009 within the Glasgow Royal Concert Hall, the Scottish Music Hall and Variety Theatre Society honoured Irene (Sharp) Cormack. Irene who is a Glaswegian had, on stage, a gloriously penetrating, yet sweet voice, whether she was singing traditional Scots songs or excerpts from operettas. George on the other hand had a fairly soft voice, but he was versatile enough to blend well in close harmony with Irene to produce what came to be known as the unique Cormack and Sharp sound.